 Im interested in the statement that madhabs were enforced due to partisanship and not due to scholarly foresight or decision, can i gain further information to read up?. Ok the scholars state that the laypeople can take a ruling without understanding the reasoning behind it from a reputable scholar, isnt that similar to what the madhabs have done, ie the pious predecessors with their methodologies have derived rulings for all thinkable and unthinkable topic areas?. Then obviously, the scholars provide the evidence, but if the layperson doesnt have the ability to understand and know, then its fruitless, wont they just take whatevers given to them, on the fact that they dont know? For example, like a doctor who gives a prescription, they can give evidence for the prescription, the patient will take it because they dont know what he is on about. Couldnt this lead to not only confusion, but a fragile deen in the layperson. The scholar always refers back to Imam Abu Hanifa for example, as the one people turn to, however, didnt his as well as other methodologies and schools of thought encompass not one, but hundreds if not thousands of scholars from inception, refining the rulings? So to emphasise the turning to the Imam, specifically, isnt correct because it overlooks the contributions that hundreds and thousands of scholars made right. How can a layperson tell which hadith is weak and which is strong without blindfollowing?. Sure, although it can be said madhabs and their taqleed was enforced due to partisanship and at times staunch and bigoted as they may have been it would also at the same instance be unfair to say madhabs were enforced due to this reason alone. It may be said or argued that this enforcing was a cause for the partisanship and also similarly and equally the partisanship was a means and a reason for the enforcing and this is how this dynamic should be understood. This has also lead to some fanatics in their fanaticism in giving Ahlul Bidah a field day and not saying anything about them but rather using petty personal egotistical concepts to attack the salafis under various garbs and fabrications. These individuals are not to be excluded from such categories below. in addition by accepting and acknowledging wherein at times madhabs were enforced due to partisanship it should also be understood scholarly foresight, islamic intellectualism and orthodox learning did have a role. These are just some of the cases and what follows are some examples of the the reasons and means why madhabs may have been enforced on the people. Let us now look at examples of how at times throughout the centuries in the Islamic Kingdom madhabs were enforced due to partisanship based on some of the reasons above. He was a great Imaam of Ahlus Sunnah and travelled to Andalus where he began to deliver lectures and open circles on Hadeeth so much so that knowledge of the prophets statement became widespread. During this time the Maliki Jurists made life very difficult for Imaam Baqee. From such jurists were the likes of Muhammad Ibn Haarith, Ahmad Ibn Khalid and Abu Zaid (Most probably Maliki) and so they complained to the ruler of Andalus at the time. Allaah aided this blessed call and Imaam Baqee’s call overpowered with the Aid of Allaah and hence the teaching and knowledge of Hadeeth spread in Andalus. Similalry Imaam Ibn Hazm mentions Imaam Baqee would teach Musannaf Ibn Abee Shaybah and some people of Rayy ie the people of opinion who historically have been adjoined and considered to be hanafis complained to the ruler at the time. Similarly such Hanafis or Ahlur Rayy caused dissent and discord amongst the people against Imaam Baqee. So this example illustrates how the Maliki and Hanafi Ahlur Rayy madhab were enforced and heavily propagated by scaring the people and those who preached anything contrary. Non madhabis would be hounded, pestered and complained about, to the government. Imaam Baqee Ibn Mukhlad did not follow a particular or specific madhab and his methodology was a universal one which still exists today ie just following the a Quraan and Hadeeth without being limited by a madhab. For example Qaasim Ibn Asbag who was a Maliki narrates that Asbag bin Khaleel who was an extremely bigoted Maliki and severely engrossed in madhabee partisanship would warn Qaasim bin Asbag not to listen to Hadeeth from Baqee Ibn Mukhlad. Haafidh Ibn Katheer and Imaam Dhahabee also mention the trial and tribulation that befell Haafidh Abdul Ghanee al-Maqdisee. In and around 595H again The grand masjid in Damascus known as Jaam’e Amawee had 4 Musallahs, one for each Madhab. Haafidh Abdul Ghanee al-Maqdisee would deliver his lectures at the Hanbalee Musallah on the issue of Asmaa Was Sifaat of Allaah and Aqeedah in general. Some of the followers of the other madhabs like Qadhee Ibn at-Turkee and Dhiyaa ud deen Khateeb ad-Daula’ee could not fathom this because they differed with him on Aqeedah as well as Fiqh as they were from different madhabs. In light of this they went to the see the ruler at the time who was Saarim ud deen Barghash. A debate on the issues of Aqeedah was organised and Haafidh Abdul Ghanee al-Maqdisee debated all of them ferociously. No doubt the opposers were followers of the other madhabs and were Asharee in Aqeedah. When Haafidh Abdul Ghanee al-Maqdisee defeated them and the Asharees and followers of the other madhabs pushed Ameer Saarim ud deen Barghash further who in the end expelled and forced Haafidh Abdul Ghanee al-Maqdisee into exile. The people were ordered to destroy the Minbar of the Hanbalis, their books and literature were thrown out and on the same day there was no Dhuhr prayer for the Hanbalis. Some historians mention Haafidh Dhiyaa al-Maqdisi, the author of the book of Hadeeth known as al-Mukhtarah was once going through and reading Imaam Uqailee’s adh-Dhu’afah to the public in Mosul, which is in present day Iraq. The people of Mosul captured Dhiyaa al-Maqdisi and put him in jail and wanted to eventually kill him. The reason for this was because Imaam Uqailee’s adh-Dhu’afah had some statements disparaging the integrity of Imaam Abu Haneefah. Such was the case that whilst in jail the executioner was about to kill Dhiyaa al-Maqdisi when at the last minute he was told to stop. Later it transpired that Haafidh Barnee had ripped the pages in question disparaging Imaam Abu Hanfeeah from Imaam Uqailee’s book and therefore in this Haafidh Dhiyaa al-Maqdisi was spared. Ahmad Ibn Dawood was the Chief Justice of his era ie the Qadhee tul-Qadhaa. Ahmad Ibn Dawood was well known for his animosity against Imaam Ahmad Ibn Hanbal in being the chief proponent and opposition to Imaam Ahmad on the issue of the creation of the Quraan. Imaam Ahmad had to suffer greatly at the injustice and partisanship of Ahmad Ibn Dawud who was a mutazilee Jahmee yet a Hanafi in jurisprudence. He has spearheaded a vehement onslaught on the Aqeedah of Ahlus Sunnah Wal Jama’ah regarding the creation of the Quraan and negation of the Sifaat. Yet he was a Hanafi, later historians and islamic intellectual authors have cited Ahmad Ibn Dawud was a staunch bigoted Hanafi and further opposed Imaam Ahmad Ibn Hanbal due to his jurisprudence and Imaam Ahmad’s firm stance on taking ahadeeth over opinion and staunch partisanship madhabism. Shaikh Ibn Khalkaan has also cited that Imaam Ibn Hazm has very clearly and manifestly stated that 2 madhabs were spread by state imposition and those in authority or in leadership, the Hanafi and Maliki Madhab. (1) Imam Abu Yoosuf was one of the main student of Imam Abu Haneefah who during his time was made the chief Judge. During his era all judgements would come via him and no doubt they would be based on the Hanafi madhab. Such a state existed from the Far East all the way to the furthest frontiers of Africa and Imam Abu Yoosuf would give positions to his students, companions and those associated to the Hanafi madhab in local law courts and as judges. (2) The Maliki madhab spread in Andalus and what is current day Spain which is colloquially known as Maghrib which also includes some of the North African States. As already mentioned Yahyaa Ibn Yahyaa al-Laithee spread the Maliki madhab in those regions as he was close and favoured by the ruler of his era. All judgements would go through him and his word would be final in such religious affairs. In addition no judge would be appointed in the whole of Andalus without his permission and he would also only advise that his students, companions and those belonging to his madhab be appointed at such positions as judges etc. Imaam Ibn Hazm discusses this in great depth and detail monumental book ‘al-Ahkhaam Fee Usool al-Ahkaam’ (1/575-576) so please refer to it. We ask is this not imposing and scaremongering the people in saying that that prayer is not valid behind a Shafiee, who in their right mind would want to be a Shafiee or even contemplate being one, knowing very well any prayer behind him would be invalid. Is this not a type of enforcing a madhab on the people by instilling the fear of consequence and reprimand? Of course it is. So now who would want to be a Hanafi when the Imaam of the Haram, Imaam al-Juwainee is effectively saying the prayer of the hanafis is invalid and because this is the case their belief regarding the prayer which is a pillar of the deen is defective, it in turn leads to the notion of the whole hanafi madhab being futile!!! Is this not partisanship being imposed and propagated as the only right way and also being enforced on the people as to show only the Shafiees prayer correctly. Imaam Bukhaari’s Saheeh al-Bukhaari is the most authentic book after the book of Allaah in fact numerous scholars of Hadeeth have cited and mentioned unanimous agreement ie Ijmaa that all of the Hadeeth in Bukhaari are all authentic. Despite this, look at what a staunch and bigoted Hanafi by the name of Abu Yoosuf bin Moosaa bin Muhammad bin Abee Takeen al-Maltee and then Halabee famously said, “Whoever looks at (ie reads) Bukhaari has become a zindeeq (ie a heretic)” (Ambaa al-Ghamr Ba Ambaa al-Umar (4/448). Is this also not scaring the people from reading Bukhaari? Who would want to become a zindeeq ie heretic? No one. This is enforcing partisanship in reversing the understanding ie the one who looks at the prophets hadeeth is a zindeeq therefore remain a Hanafi!!! From the later scholars Mulla Ali Qari Hanafi cited what the author of Kaidaani said that the 10th haram or unlawful thing to do in the prayer like the Ahlul Hadeeth do is the moving and pointing of the finger. This is the practise of those who follow the Hadeeth. (Cited by Shaikh Rasheed Ridha in his introduction to the al-Mughni (1/20). Is this not enforcing a madhab based on partisanship and sheer neglect and disregard of scholarly foresight and differences. How unfair and unjust is it to say following any of the madhabs is correct yet at the same instance we have such confrontational bigoted statements that indicate that only one madhab is actually really correct according to them. The well known and hugely followed Hanafi madhab was enforced and spread via the state and in this regard also imposed on the masses. The government of that time was mutazili and Jahmi in belief and manifested itself at the state level in around after the second century. The state was under the rulership of Mamoon Rashid who began is rulership around 198H but manifested and propagated his mutazili and Jahmi beliefs around 212H. This mutazili and jahmi government lasted and ruled for approximately 40 years and during this period it’s heads and leaders worked emphatically and vigorously to spread their beliefs and madhab in terms of Aqeedah. Allamah Ibn Athir said concerning the events of 323H, “The status of the Hanabillah grew, so wherever they saw fermented alcohol they would spill it and wherever they saw a singer they woulkd hit him and also brake the musical instrument. If they would see a man with a woman or children they would ask him who they were? If he replied correctly they would let him go and if not they would severely beat both of them and declare her to be a fahishah and then hand her over to the government officers. For example the author of Khulasatul Kaidani mentions, if someone does Raf ul-Yadain, says Bismillah loudly in the prayer, says Amin loudly in the prayer and points his finger in the tashahud, then all of these affairs are from those which are haram ie unlawful (ie invalidate the prayer.). (Khulasatul Kaidani pg.15-16). Similarly others have said raising the hands ie Raf ul-Yadain is makruh in the prayer ie is it prohibitively disliked (refer to Radd ul-Mukhtar 1/654 and at-Tatarkhaniyyah 1/562). During the time of Shaikh Abu Hafs Kabeer the well known Hanafi scholar, a Hanafi man prayed behind someone and recited the Fatihah (in opposition to the hanafi madhab) behind the imam and he also raised his hands ie Raf ul-Yadain. When Shaikh Abu Hafs found out he went and complained to the ruler of the time, who in turn ruled for the Hanafi man to be publicly lashed. Then we have Isa bin Abu Bakr bin Ayub who died in the year 624H, he was considered to be a scholar and prolific orator, he was also the ruler of Damascus for 8 years. Shaikh Mulla Ali Qari Hanafi said about him that he was of virtuous faith and a blessing upon the deen. Isa bin Abu Bakr was also responsible for writing a refutation of Imam Khatib al-Baghdadi and he falsely attempted to prove that Imam Ibn al-Jawzi was a Hanafi. All of these disgareements, quarrelling, argumentation, bigotry, staunchness, animosity and enmity all in the name of madhabs and blindly following them. It is these traits that led to the 4 separate musallahs in the first house of Allaah ie Ka’aba. Dear Muslims how is it conceivable that based on our pristine and beautiful religion about which the people of the book would envy us led to such sects and factions in the first house of Allaah whilst making the most important aspect of worship ie the prayer. There are also other differences in which they have shown extreme bigotry and scare monging tactics and thereby strongly refuting and rebuking the opinions of the other madhabs. What impression and understanding does this give to the hanafi muqallid with regards to the other madhabs and people who believe one must recite fatihah behind the Imam, how comfortable would they feel if they prayed in their masjid!!! Also what do we do about the positions of the other Imams and madhabs like for example Imams Shafi, Ibn Mubarak, Ishaq ibn Rahawaihah, Awzai, Abu Thawr, Bukhari and many others who heled the opinion that Fatihah should be recited behind the Imam. Are they worthy of soil being put in their mouths, their teeth being broken and fire put into their mouths??? Subhanallah, The Imams Bukhari and Baihaqi even wrote books on this topic obligating the reciting Fatihah behind the Imam. Unfortunately this is the result of blind bigoted partisanship and such opinions lead to this level of sectarianism which ultimately lead to discord, chaos and dissention in the Ummah and the end goal of all of this is that a Muslim is prohibited and restricted from following and obeying the Book and the Sunnah. May Allaah keep us upon the Quran and Hadeeth. Ameen. Dear readers can you imagine what confusion and disorientation there would have been whilst trying to pray in such an atmosphere. In our daily lives it becomes difficult enough based on the background noise can you imagine what the atmosphere would have been like. What can be more of an example of partisanship and bigotry than this in the house of Allaah, this is what sectarianism and madhabism always eventually leads to and this is also the situation in our times. What is even more disturbing and worrying can you imagine what level of Khushu, Khudhu and concentration some of these worshippers must have had when they were praying in such an atmosphere, knowing very well the prayer would be the first thing to be judged on the day of judgement. In part of this series in relation to question no.4 where the questioner asks about hundreds and thousands of scholars refining and correcting a madhab from within. Indeed then this is nothing but a fallacy as most often the scholars continued to defend their madhab irrespective of the positions. And we have not even began to talk about the current day issues of bigotry and staunchness and if this was the case we would run into volumes. There have been cases of severe physical abuse upon people who changed from hanafis to Ahlul Hadeeth, masjids being destroyed and burnt, scholars being shot and injured, houses being burnt and destroyed. Masjids banning the Ahlul Hadeeth, washing the places where an Ahlul Hadeeth prayed Salah, breaking the Ahlul Hadeeths fingers whilst they supplicated with them in the tashahud etc. Likewise Allamah Rashid Ridha mentions that, “A Hanafi from Afghanistan heard that a man whilst praying recited the Fatihah behind the Imam, so a person punched him so hard in this chest or stomach that he fell down in sheer agony, pain and nearly died from it. I have also been informed that someone broke a persons finger just because he was moving it during tashahud. In the last century the people of Tarbulus were engrossed in so much partisanship and sectarianism to such an extreme level that some of the Shafis went to the main mufti and asked him to divide the masjid into 2 halves one for us and one for the Hanafis because their jurists (ie the Hanafi faqihs) consider us to be Ahludh-Dhimmah. This way of bigoted staunchness was not the way of the salaf, they still had mutual respect for each other and differing opinions. There are numerous examples from during the times of the companions who despite differences would still respect, listen and pray behind each other. Likewise and similarly if they saw or found someone from amongst their companions they would advise them by giving them evidences from the Quran and Sunnah. and Abdullah Ibn Masood (RadhiAllahu Anhu) would place his hands between his knees during the ruku (Sahih Muslim 1/202). Ibn Umar (RadhiAllahu Anhuma) believed that the eyes should be open during the Ghusl of Janabah (refer to Zarkanis explanation of the Muwatta 1/92) and many many more. However they still had that respect and prayed behind each other. Shaikh ul-Islam Ibn Taymiyyah mentions despite the differences between the companions and the successors they would still pray behind each other. (Refer to al-Fatawa al-Kubra 2/380). 2) Ok the scholars state that the laypeople can take a ruling without understanding the reasoning behind it from a reputable scholar, isnt that similar to what the madhabs have done, ie the pious predecessors with their methodologies have derived rulings for all thinkable and unthinkable topic areas? I think there seems to be an incorrect understanding with regards to this discussion. We say a normal lay or average person can ask Ahlul ilm or a scholar pertaining to any issue which the lay person then goes and acts upon. With regards to this the scholars have differed whether this is taqlid or not. Some have classed this as ittiba and they use the ayah which states ask the people of knowledge if you do not know. This is more accurate as this what the earlier Muslims did and no one use the word Taqlid and hence this is the reason you will not find the usage of this word in the first three generation. That a single pne said to another go and do taqlid of so and so in all of their affairs. This no longer remains taqlid, in this situation it is not necessary the for lay person to understand the intricacies of the evidence ie the Asbab an-Nuzool, Qate ud-Dalalah Aam, Khaas Raje Wal-Marjoo etc but what suffices and what is is important is that he knows and comprehends there is evidence from Allaahs book or the Sunnah. The madhabs evolved in different ways, each very different from the next. What is also important to note these madhabs were not formulated during the eras of the Imams but years later, in fact 3 to 4 centuries later. The Imams themselves would derive rulings from the Book and the Sunnah and this is an undeniable fact. However in the same instance these Imams applied their own individual ijtihad. In doing so they also applied and formulated some of their own principles and rule, each differing from the next. Therefore they based their rulings on some of these principles and rules. So now with all of these different rules and principles they differed with each other and so it is very possible they also made mistakes. So due to these principles and rules their understanding and attempting to reconcile the ahadeeth may have led them to err and make mistakes in their rulings. Numerous examples can be highlighted here and this would lengthen the discussion. The main point is that the Imams as great and revered they were in terms of their knowledge and comprehension, were at the end of the day humans and made errors. We have not been obligated to follow their mistakes or errors. When Imams, Malik, Shafi and Ahmad ibn Hanbal said this can last till 4 years. Walid ibn Muslim mentions that he narrated to Malik that Jamilah bint Sa’ad narrates from A’ishah (Radhi Allahu Anha), “A woman does not exceed 2 years of pregnancy.” Imam Malik said Subhanallah, who says this? The wife of Muhammad bin Ejlan remained in her mothers womb for 4 years. Shafi said Muhammad bin Ejlan remained 4 years in his mothers womb. Ahmad said the women of Banu Ejlan would remain pregnant for 4 years.” (al-Mughni 8/84-85 of Ibn Qudamah). And there are numerous examples. The most comprehensive point in rebutting and expanding on this point is that if all the madhabs took from the Quran and Sunnah, why are there so many differences amongst them in these issues and we know this is a clear reality. We will not go into the different usools the madhabs formulated for themselves and then differed with each other base don their understanding of the texts. The main problem here is that we accept the Imams took from the Book and the Sunnah, but what is obligated upon us ie the normal lay Muslims. Then in later years their respective students modified the rulings of their respective teachers, and then they presented their own fiqh with the modifications. Then their students did the same and this continued over the years. Some of the scholars preserved the rulings of the imams so for example in the Hanafi madhab you might have three opinions ie one of Imam Abu Hanifah, one of Shaikh Muhammad Shaybani and another of Qadhi Abu Yusuf but the questions is what is the actual ruling and whose ruling was it and what evidence did they use. Therefore it is possible the madhabs in their own way derived the necessary rulings for a whole host of issues based on their formulated principles. So firstly they differed with each other. Secondly who exactly made these principles and rules. Thirdly when we say the madhabs did this ie formulated or derived the rulings, yet again what is exactly meant by this? Is this not following a way other than the Book and Sunnah even though they may have used the same sources for their extraction and interpretation. Fourthly what does an individual do when he knows their madhab is going against the authentic hadeeth. This indeed is a burning question!!! Kawthari the defender of the Hanafi madhab in his brief summary in answer to a point raised by Imam Juwainee essentially argued that the 4 Imams were not infallible or entirely certain with regards to the rulings. He said Imam Abu Haneefah remained silent and did not pass judgement on many issues. Imam Malik said regarding many issues that he did not know. It is well known and famous about Imam Malik that whenever he did not know the ruling on an issue or topic ie he was unable to derive a ruling he would say I don’t know, la adri. The two well known scholars of the west, Imam Ibn Abdul Barr and Allamah Shatibi opined that if all of these instances were collated and compiled it would amount to a short treatise. (al-Muwafiqat 4/288). So when we know and accept and even the staunchest of the muqallideen or muqallids and there is no one more deserving of this title than Kawthari Hanafi, that even he admits and accepts that the Imams did not have all the knowledge and they would clearly say I don’t know and then centuries later we are hell bent in trying to prove and establish the 4 Imams had enough knowledge to derive all the rulings even today. This is is especially so when the modern world has thrown us more challenges. Another important angle or aspect to consider and this is again another pivotal point, how many books did each of the 4 respected Imams leave. What books did Imam Abu Haneefah leave on Fiqh? Is Fiqh ul-Akbar or Fiqh ul-Absat really his books and if so were they on aqidah or Fiqh. Imam Malik left his Muwatta but is this a book of Hadeeth or is this a book of Fiqh? How many did Imam Shafi and Imam Ahmad bin Hanbal leave, can it be argued his book al-Musnad is a book of Fiqh or Hadeeth. How accurate and correct would it be to include the issues ie the ‘al-Masails’ his sons and students compiled by asking him questions as part of the Hanbali madhab. We have already mentioned for example Imam Abu Haneefahs students who differed with him extensively but can we classify and add the books of his students within the rulings of Imam Abu Haneefah or the Hanafi madhab. For example Imam Shaybani’s al-Jami as-Saghir, al-Kabir, Kitab al-Asal and many more. Similarly Qadhi Abu Yusufs ‘al-Amwal’ and what do we say about his book ‘Ikhtilaf Abi Haneefah Wa Ibn Abi Layla’ can such a book highlighting Ibn Abi Layla’s differences with Imam Abu Haneefah be classed and included in the books of the Hanafi madhab. Furthermore, these Imams were indeed illustrious and pivotal in the derivation of issues of Fiqh but this alone was not sufficient as other sciences were not completed or were still on the early stages of formulation or progressive for example the sciences of Hadeeth, the biographical notes and science of praise and criticism. So therefore it is possible not all rulings were entirely accurate at the time they were made or they were made on weak narrations etc. In addition to this not all knowledge is just contained in Fiqh but rather also in other sciences and the Scholars and their students were possibly not proficient in all the sciences. This is what the late Deobandi Hanafi scholar Anwar Shah Kashmiri said, “Whoever thinks all the knowledge is contained within Fiqh and there is nothing outside of it, then he is far away from the truth.” (Faidh al-Bari 2/10). So in light of this when we know there were many differences between the scholars and the scholars themselves admit to not knowing all the answers to some of the issues and when we know that not all the knowledge was contained just in Fiqh. How is it possible or feasible to hold on to a particular madhab or to say all the rulings contained within a madhab are correct and worthy to be followed. Another interesting point here and it is to be noted very well, that when the madhab of Imam Abu Haneefah was formulated, which was the first madhab and this students who differed with him in numerous issues contributed to the madhab, then if this was the case why was there a need for other madhabs to be established. In addition to the four main madhabs we also had the madhab of Imam Laith Ibn Sad, Imam Awzai, Imam Sufyan at-Thawri and Imam Sufyan, why were all of these madhabs formulated if they are also doing the same thing is deriving and establishing rulings from the book and Sunnah. We have also previously mentioned what does a madhab actually entail, whose madhab is a madhab? Let’s take the Hanafi madhab for example. The rulings that we have in the Hanafi madhab whose rulings are they exactly? The people claim they are following the Hanafi madhab however the rulings and their derivation was not carried out by a single person say for instance only Imam Abu Haneefah but Imam Shaybani, Qadhi Abu Yusuf and Shaikh Zafar also contributed, in fact the common understanding is that a committee of 40 scholars was set up and they all collectively contributed towards the formulation and derivation of the legal rulings and edicts. Did not the Hanafi madhab abandon the established position of the madhab in certain issues, for example the issue of the lack of information of the lost husband in which the Hanafi madhab issued a ruling based on the Maliki madhab and at times the Hanafi madhab left their own madhab for the statement and ijtihad of Ibn Abi Layla. The Imam himself, Abu Haneefah said, “It is unlawful for a person to issue a verdict based on my statement if he does not know my evidence.” (al-Mizaan al-Kubra 1/58 of Sha’arani) Therefore when the evidence becomes known, how is this taqlid??? So even if an individual wanted to do Taqlid and the evidence came to him according to some of the statements and principles outlined above, he will still be sinful and liable for punishment. How fair and sane is this? Is this not pushing people away from following the Quran and the Sunnah. This obligation of following the book and the Sunnah is a great obligation which has been ordained and commanded in the Quraan. It is also in the core aspect and root of a Muslim to follow the Quran and the Sunnah but here any such chances and options are severed by saying the people are sinning and are likely to be punished. We guess the question here is, why is this just limited to the 4 madhabs and not to other scholars. This is essentially one of the main problems, derivation of Fiqh has been restricted and constricted to just 4 madhabs and then on top of that even those rulings are ambigious, as no one is sure whose ijtihad it is. We have already mentioned it is not possible for us to know all the evidence the Imams used to issue their verdicts, it’s not a case of understanding the evidences or trying to delve into them. It is however important to now there are appropriate evidences from the Quran and Sunnah to support such or any ijtihad. As already also mentioned Muhammad Hussain Kawthari Hanafi also said something similar in his own words in his bookAhqaq al-Haq. Dear readers does this not show us, based on the numerous statement quoted above that the Imams did not know or had all the evidences for all of their rulings and ijtihad. So how fair would it be to say that they derived rulings from the Quran and Sunnah when some of the Imams themselves did not know or did not have all evidences for every ruling. Another example of this is what relates from the well known and famous student of Qadhi Abu Yusuf, ie Asaam bin Yusuf al-Balkhi. He would differ with Imam Abu Haneefah on a numerous issues. In the issue of Raf ul-Yadain ie the raising of the hands, not only did he differ with Abu Haneefah but also with Qadhi Abu Yusuf and adopted the way of the scholars of Hadeeth (ie raising the hands). This lead to certain scholars, Imam Ghazali being one of them, to opine that Shaikh Muhammad Shaybani and Qadhi Abu Yusuf differed with Imam Abu Haneefah in 2/3 of his fatwas and rulings ie ijtihad. Then the later scholars of the same madhab differed with these rulings of the madhab and the earlier Imams. Hence when they would issue fatwas or verdicts they would say the fatwa is based on the statement of so and so ie other scholars within the madhab or they would say the fatwa of such and such or so and so has precedence or acceptance in the madhab. It is apparent these changes, within the madhab would and could only come about based on the evidence the later scholars would present. So when there are such strong and powerful inter differences within a madhab and these differences and complications are accentuated between madhabs and then they have own their inter differences, what guarantee is there with regards to the accuracy and preciseness of the legal rulings and fatawa being disseminated from a madhab or the different madhabs, or being derived accurately from the Quran and Sunnah. Therefore why not take the safer and more accurate – tried and tested method of just asking the people of knowledge who will give you and evidence and you just follow that. If and when something different comes then accept and change according to the evidence. This method is fool proof and this was the method employed during the first three blessed generations. We know all of the above restricts and prohibits a person from following and acting upon the Sunnah and therefore we should have the utmost fervour and zealousy to act upon the hadeeth. It is such thoughts that have led the Muslims to be chained endlessly in the shackles of taqlid. Some of the scholars knew what the truth was with ie in other madhabs but because they were forced and obligated to follow their own madhab, this eventually led them to rejecting the truth. So we ask is this not denying and rejecting the truth knowingly when an individual himself admits and knows what the truth is. The truth is that the later day muqallids are also aware of what the truth is. However they are chained and restricted by these shackles and in this era they cause confusion and attempt to deny taqlid shaksi whereas in reality this is what they really believe in. Else how is it possible for a scholar who knows the truth but yet he still continues to deny and reject the truth and traverses in his blind taqlid of his Imam. It must also be said the scholars who derived rulings did so based on the general need and not due to the principles and rules of a madhab. They all had their specific principles and if this is the case then this what the non muqallideen and non-madhabi scholars have done and still do. So this shows even though most of the scholars of that era had their own usool and made their own ijtihad, It does not indicate they concurred and secondly how is this even an argument for taqlid and madhabs. On the contrary this shows their open mindedness with regards to ijtihad. Lastly, since they had their own usools and therefore by default their ijtihad was independent. So it would be safe to say this is totally different to what is being propagated today. However how about all the occasions in which the scholars within the same madhab differed with the official verdict of the madhab after they did their ijtihad or derivations. It is very strange here that all the differences, contradictions and oppositions within the madhabs have been overlooked and overshadowed. So lets look at another example of how the scholars derived these rulings and what principles they had. It is well known and there is Ijma that the most authentic book after the book of Allaah is The Sahih of Imam al-Bukhari and then the Sahih of Imam Muslim. So when we know a hadeeth is in these books it is taken and readily accepted. We also know the hadeeth is from the Messenger of Allaah (Sallalahu Alayhi Wasallam) and this is a well known, established and an agreed upon principle. All the scholars of Islam and the scholars of usool are agreed the ahadeeth of the Sahihain have precedence and acceptance. However the ninth century hanafi scholar Allamah Ibn Humam and his student Ibn Amir al-Haj differed with this principle and understanding and said the readiness to accept was incorrect. (Refer to their Fath ul-Qadir 1/317-318, 3/183 and at-Taqrir at-Tahrir Fi Sharh Kitab at-Tahrir 3/30). Allamah Jaza’airi (in his Taujeeh an-Nazar pg.120) has severely refuted and reprimanded this idea and said it was from whims and desires and that accepting the narrations from the sahihain is a well established principles which is solid and only those with desires reject this. The latter day Hanafi Scholar, Shaikh Abdul Hayy Lucknowi has also rebuked the hanafi elders and said accepting narrations from the Sahihain is the way of the Muhaditheen and in fact there is ijma upon this. Only Ibn Humam and Ibn Amir al-Haj and their followers have opposed this. (al-Ajwabah al-Fadhilah pg.56). However these corrections are overlooked and ignored. So the point here is, how would it be possible to derive the rules and issue fatwa fairly and accurately to the best of the mujtahids ability when this is the affair and situation of the principles and usool. Surely the fatawa would have been biased and void of authentic texts and in the bigger picture how reliable would the fatawa be. In addition to this we would be expected to follow this forever until the rest of our lives as being muqallids we dont have the choice to ask, let alone question. 3) Then obviously, the scholars provide the evidence, but if the layperson doesnt have the ability to understand and know, then its fruitless, wont they just take whatevers given to them, on the fact that they dont know? For example, like a doctor who gives a prescription, they can give evidence for the prescription, the patient will take it because they dont know what he is on about. Couldnt this lead to not only confusion, but a fragile deen in the layperson. Dear readers this shows the mindset of the scholars and mujtahids from the time of Shah Waliullah Dehlawi. These scholars knew the evidences and understood them well but yet they still chose to do taqlid shaksi and taqlid jamid, ie bigoted and staunch taqlid. So when this was the thought and mindset it shows what kind of passion they must have had to prove and establish their own madhab to be correct in the realm of this partisanship, how trustworthy can this be? So when this was the situation with the scholars who were following the madhab, what hope would there be with the general masses. The scholars were not always seeking the evidences. The evidences they had were treated in such a way that they were figuratively explained. So based on this do we expect the masses to just accept the opinions of the scholars of a madhab or the position of the madhab itself??? This appears as a very weighty point ie that a whole array of scholars refined and perfected a school of thought. However it still needs to be looked at with regards to its exact nature and the practicality of it. It is all very well saying this but we also need to see if this actually happened and what the outcomes were and what the usage of this is today. Also this point is not too different from question number 2. Likewise Allah has commanded us to establish the truth and to abolish falsehood, the question is, are we doing this based on what the truth is or are we doing this based on what the madhabs say. At the same instance are we being engrossed in madhabi fanaticism all in the name of hundreds or thousand of scholars refining and correcting a madhab. This understanding also has some major problems, although this may have been practised, it also brought more confusion and more inter madhab opinions, which most of the people are unaware of and this ultimately leads to the conclusion that the final verdict of a madhab is ambiguous. We don’t know who the fatwa is from. If it is argued, as in this case it is hundreds of scholars then this is something that is not legislated, as Allaah has commanded us to ask the people of knowledge ie a scholar and not a whole group. Is this not setting up a sect within Islam in that we have a whole array of scholars who spent their lives refining and perfecting verdicts and edicts based on the understanding of a certain madhab. At the same instance we are acutely aware that some of the scholars left the shackles of the madhab and issued edicts based on the Quran and Sunnah even though they went against the madhab. This very same idea led to bigotry, staunchness and partisanship because this idea was enforced in the minds of the people, that we have refined this madhabs so much that it is not possible nor the need to look elsewhere. Did this then not only create more partisanship. For example Ibn Abidin said concerning the classical manual on Hanafi Fiqh, the Mabsut, “Any statement which is in contradiction to the al-Mabsut will not be acted upon, it will not be given any attention nor any will there be any legal verdict issued based on it.” (Rasail Ibn Abidin, Risalah Sharh al-Manzoomah al-Musamah Bi-Aqud Rasm al-Mufti 1/20). So now the author of al-Mabsut Muhammad bin Ahmad bin Abi Sahl died in 499H and is based on the explanations of the works Shaikh Muhammad Shaybani, would it be fair and just to say any fatwas, difference of opinion or REFINING after the al-Mabsut be accepted and acted upon by the people who follow the Hanafi madhab. Of course not but where does this leave the hundreds of scholars who allegedly refined the madhab. As here it is clearly stating any refining or new ijtihad will be rejected and not given any attention. This very clearly rebuts and renders this argument null and void according to the classical Hanafi scholars themselves. As we have mentioned a few times there have been numerous instances when the scholars or the founding scholars of a madhab have differed with each other so much, for examples, Imams Abu Haneefah, Shaikh Muhammad and Ibn Abi Layla differed so much that citing all the examples or even most of them would lengthen this treatise. Some other examples are when Shaikh Muhammad Shaybani even after citing the evidences of Imam Abu Haneefah in his Kitab al-Athar, he fails to accept them and in fact when he differed with Imam Abu Haneefah he would provide evidences for his ruling and differing. Qadhi Abu Yusuf also differed with the fatwas and rulings of Imam Abu Haneefah. Sometimes this refining does not change anything and the madhab remains as it was and in essence this so called refining and fine tuning remains only and exists in wording. For example the scholars more specially the Imams with reagards to the takbeerat for Eid, Imam Abu Haneefah said 6 takbirs are to be pronounced where as the rest of the Imams said there should be 12 takbirs. So Fatwa Qadhi Khan and Hidayah mention that more than 6 takbirs is an innovation. A current day eminent Hanafi scholar, who is allegedly, supposedly and hypothetically refining the rulings says the same that Imam Abu Haneefah said more than 6 takbirs is an innovation and he rejected any additional takbirs. The question here is not the evidence for 6 or 12 takbirs neither is the issue in itself important, however what is important is the ruling that more that 6 is an innovation. So on the basis of this refinement, Abu Bakr, Umar, Abu Hurairah, Ibn Abbas, Ibn Umar, Abu Sa’eed al-Khudri, Aishah, Zaid Ibn Thabit (RadhiAllaahu Anhuma Ajma’ieen) and from amongst the successors, Umar bin Abdul Aziz, Zuhri, Makhool and in addition to them the seven famous jurists of Madinah and the Imams of Fiqh in general including, Malik, Ahmad, Ishaq and Awzai all opined and help the position that the takbir should be pronounced 12 times. So are all these people innovators??? All – just in the name of refinement. How about the Hanafi scholars who differed with this opinion. So at what expense based on this array of scholars who helped refine this madhab, be taken, at everyone elses expense. This does not seem praiseworthy nor acceptable from the angle of respecting the other Scholars, the vastness of knowledge and even from the angle of ijtihad. We have already mentioned the fruits and results of this bigoted and staunch refinement in parts 1 and 2 so much so that the likes of Imam Shafi, one of the four main Imams was declared to be ignorant, again at what expense, the refinement of the madhab and the deen. Shaikh Mulla Jiwan the Hanafi declared Imam Shafi ignorant on the issue of issuing edicts based on oaths of the witness and claimant. He goes onto say the first person to do this was Mu’waiyyah. (Refer to his Nur ul-Anwar pg.298, another edn. pg.304). Mu’awiyyahs (RadhiAllaahu Anhu) ijtihad was that if a claimant does not have 2 witnesses then one witness would suffice with the claimant taking an oath. Mu’awiyyah (RadhiAllaahu Anhu) was not alone in this ijtihad but the rightly guided Khulafa, the 7 jurists of Madinah and also the fatwa of the three imams, namely Malik, Shafi and Ahmad. (Refer to Nayl al-Awtaar 8/290). Imam Nawawi stated, “The majority of the scholars of islam, the companions and the taboeen and the scholars after them in the various lands also concluded the same. This is also the fatawa of Abu Bakr, Ali (RadhiAllaahu Anhuma), Umar bin Abdul Azeez, Malik, Shafie, Ahmad, the jurists of madinah and all the scholars of hijaz and most of the scholars of the different lands also agreed with this ijtihad and verdict.” (Refer to Sharh Sahih Muslim 2/74). However Imam Abu Haneefah and some other jurists differed with this, again the issue is not significantly important here, however what is important and what is worthy to be noted, is the stance and method employed which was ultimately developed due to partisanship, sectarianism, bigotry and staunch rigidity in what the Hanafi madhab concluded and that this was a Bidah which Mu’awiyyah (RadhiAllaahu Anhu) started. (Sharh Waqayah 1/205). Again the question arises, okay there may exist a legitimate difference of opinion between the fuqaha but should such refining and fine tuning lead to such beliefs in the first place that Mu’awiyyah (RadhiAllaahu Anhu) was an innovator!!! We indeed seek Allaah protection from such statements and may Allaah be pleased with Mu’awiyyah (RadhiAllaahu Anhu), Ameen. In light of refinement by scholastic academics of the madhab this notion of Mu’awiyyah (RadhiAllaahu Anhu) being an innovator should have been deleted and omitted from the books, but was this the case? No. It remains in their classical books of Fiqh till this day. Is this our understanding if our refinement that at its expense we open the doors to shiaism. And numerous Hanafi scholars of Usool and principles have mentioned numerous such statements concerning the companions throughout the ages. There are so many that it would be so lengthy to mention them here but it is really shocking to see and read so many such similar statements. So is this the refining we are seeking, that some scholars in the past have mentioned such statements in belittlement of the companions and then after hundred of years later, under this so called refining this si the result and outcome! Is there any censure, reprimand or admonishing for this? No. Rather we find them affirming such statements and they say, we just don’t have the courage or guts to say the same. So we ask is this the desired, accepted and expected refinement we seek after centuries. We ask did the madhab also refine the statements for example Qadhi Khan says about Anas Ibn Malik (RadhiAllaahu Anhu) he would eat a lot of different types of food and fill his stomach so much that he would eventually have to vomit(Fatawa Qadhi Khan 3/403). Who would say this about our beloved companions!!! We don’t see any of the Hanafi scholars reprimanding this statement. Qadhi Khan or any other treatises saying this, is a despicable mistake, rather we find all kinds of excuses with regards to what he could have meant or his intended meaning was something different. Imam Ibn al-Jawzi mentioned that Anas (RadhiAllaahu Anhu) was from the Sahabah who had a lot of Zuhd (Abstinence) (Sifatus Safwah 1/710). The arch ardent and staunch Hanafi, Muhammad Zahid Hussain al-Kawthari says about Anas (RadhiAllaahu Anhu) that his memory deteriorated as he got older. (Tanib al-Khatib pg.117). No one from the hanafis reprimanded him for saying this as this was just another way of saying Anas (RadhiAllaahu Anhu) was not a faqih companion, so in essence the point remained the same but just a different way of addressing it. So we ask where is this refinement of hundreds and hundreds of scholars? So who defended the honour of Anas (RadhiAllahu Anhu) and reprimands Mr Kawthari from amongst the hanafis? The noble and virtuous scholar of Yemen, Shaikh Muallimi Yamami reprimanded Kawthari and said, “We don’t know anyone before Kawthari who said this.” (Tilyah ut-Tankil pg.66). This is the sign of a scholar, whose iman comes into play and no matter who the person is, there is reprimand and this is what we call refining, in that any incorrect notion or position is corrected, this is the very basic of our understanding. The Neo madhabists who believe we all must conform to a madhab then jump in and they attempt to answer such major discrepancies with the rulings of the madhabs, who in essence and in reality have no idea what they are talking about but for the ardent sake of defending their fellow madhabists they feel the need and importance to do so, this is what we are referring to as ardent and vehement partisanship. Where is that fervour of our Imam, where is that power of our Imam, that anyone say this about our Sahabah, dishonour them and degrade them but we hide behind the curtains and doors of madhabism, shame on us!!! Shaikh Anwar Shah Kashmir Deobandi Hanafi has admitted the books of the hanafi madhab include the issue that if the hanafis and shafis are debating in the month of Ramadhan and they feel or think they are weak due to energy, then it is permissible for them to break their fast in order to debate with the shafis. Let us look at another example at why this refining not only does not work, but it lands a follower in more grave danger and severe problems. For example Shaikh Hussain Ali who was from the students of Maulana Rashid Ahmad Gangohi Deobandi Hanafi and the teacher of the another revered Deobandi Hanafi scholar, Ghulamullah Khan, so effectively from this century or you could argue in the 21st century, they said about Raf ul-Yadain that it is not established from the Messenger of Allah (Sallalahu Alayhee Wasallam) let alone it being abrogated. Now this is allegedly and the supposed refining we thought was going on. The older Hanafi scholars opined that Raf ul-Yadain was abrogated and no doubt they are mistaken and have erred on this point, al-Muhim the point here is that they concluded it was abrogated. From them include Imam Tahawi, Shaikh Ibn Humam, Shaikh Kasani, Shaikh Ayni who ranged from the 5 century onwards and now based on centuries of scholarship instead of admitting that Raf ul-Yadain was an established practiced this refining has reversed and gone backwards. Also most of the scholars of Ahlus Sunnah said Raf ul-Yadain is mutawatir and it should be noted the eminent Hanafi scholars from the likes of Shaikh Abdul Hayy Lucknowi, Shaikh Anwar Shah Kashmiri and Maulana Badr Alam all concluded that Raf ul-Yadain was mutawatir also. So there was and there still is this tahazzub, partisanship and sectarianism, this refining and fine tuning is just a myth. So when they did do any refining or clarifications it seemed to have fallen on deaf ears and blind eyes. For example as it relates during the time of Shaikh Abu Bakr al-Jurjani, a Hanafi man wanted to marry a woman from amongst the Ahlul Hadeeth, so he asked her father, who stipulated the condition that he should recite Fatihah behind the Imam and raise his hands as he went into ruku. So the man ended up doing this. Another example of this fine scholarship, academic contribution and refining of the madhab is the example of the issue of one witr as occurs in the authentic ahadeeth. Now we know the hadeeth is authentic and this has been accepted by the hanafi elders, but how come the ahanf don’t act upon this hadeeth. This issue of refining is leaving so many hanafis abandoning this hadeeth and Sunnah, is this what refinement does to a madhab that after 1400 years we can not still act on an authentic hadeeth. We say, what is the use of such academia and scholastism! So here we ask what kind of scholastic refining is this, is this not opening the doors to denying and rejecting ahadeeth and each and every individual will be responsible for his own actions. One can not deny or hide the behind excuse that I just did taqlid of the Imams or my Imam or scholars! The scholars have specified when your hear a fatwa of a mujtahid and it is correct, then acting upon it is permissible. So this refining was on the ijtihad and fatwa of Ibn Abi Layla and if this is the case how can the people say we follow the hanafi madhab. This example and numerous others we have cited indicate that the madhabs were formed in this way with a whole array of opinions and ijtihad which is not what Allah obligated upon us. The obligation upon is to follow that which Allah revealed, ie the Quran and Hadith. Dear readers let us not be from amongst those who deny ahadeeth just in the name of scholastic refining as there will be no excuse before Allah and when his Messenger his standing at the pool. How can we forget the famous and well known principles that were formulated in defence of the hanafi madhab, its rulings and positions all in the name of refining for blind bigoted fanatasicm. Subhanallah so these are the principles have been set up to refine and fine tune the hanafi madhab, no dout this and other such principles are a means and tools that have been innovatively formulated to fight and oppose the Quran and Sunnah. This again is another deprived and grave statement becaue there is no way possible to look at these principles in a positive light at all and all those who fail to comprehend this need to stand back and wash away their stubbornness and arrogance coupled with blind fanatical bigoted staunch partisanship. May Allaah save us from this, Ameen. There are also some very ignorant individuals who post on deceptive forums coining our name of Ahlul hadeeth, who have the sheer depravity to say why do we look at this in a negative way, there are also a number of positive interpretations!!! Or those lost, confused and narrow minded inviduals who have in recent times unleashed a wave of spider web based arguments in their vile attack of the Ahlul Hadeeth. Where they utter and repeat like parrots, what are the usool of the Ahlul Hadeeth. InshaAllah and indeed this will be replied to very soon. So we have spoken about how blind fantacism, partisanship and staunch bigotry has lead to a whole host of problems within madhab and with other madhabs. However most of these issues were pertaining to issues of fiqh. The mujtahideen and righteous scholars had no problem in changing their opinions and stances on a whole array issues and this spread across a vast spectrum of rulings but the muqallideen, especuilly the current day ones have looked at this as something censurable and blameworthy. For example in the hanafi madhab, we have the issue of the Dhimmi (a disbeliever residing in a muslim country) that if we was to swear or abuse the Messenger of Allaah (Sallalahu Alayhi Wasallam) there is no punishment upon him and his convenant with the Muslim rule does not break. The famous Hanafi jurist, Allamah ibn Najeem writes in this regard, “The soul of a believer is inclined and disposes towards the position of the Mukhalif (ie the opposers, opponents and in this case the Shafis [and the Ahlul Hadeeth and Saalfis] who establish a punishment on such an individual ie qatl) BUT IT IS OBLIGATORY UPON US TO FOLLOW OUR MADHAB.” (al-Bahr ur-Raiq 5/135). Meaning we don’t like the position in our madhab but following the false opinion and position is obligatory upon us as this is what our madhab necessaitates upon us. It is most pertinent to ask here what refining are the scholars doing since the inception of the madhab, when even in issues of Aqidah they can not leave their madhab. This is not refining, this is misguidance!!! This is another example that renders the principle and concept mentioned in the question to be null, void and futile. This is because the shackles and chains of taqlid, partisanship and sectarianism can never come off and this is why there is no refining and correction. In the issue mentioned above about cursing and swearing to the Messenger of Allaah (Sallalahu Alayhi Wasallam) the hanafi scholar Allamah Ibn Humam disagreed and differed in many issues of the hanafi madhab and he also does so in this issue of swearing to the Messenger of Allah (Sallalahu Alayhi Wasallam) (as he has mentioned in his book Fath ul-Qadeer 4/381). The point here is that we have been talking about refining, correcting the rulings and positions of a madhab. So in this instance of swearing to the Messenger of Allah (Sallalahu Alayhi Wasallam), it is shocking to know that in the name of this alleged and supposed refining Shaikh Ibn Najeem discusses this issue and totally ignores and overooks the position of Shaikh Ibn Humams on this issue as if it never existed or was unimportant!!! Somehting to think about. So the example above is another yet another one that shows there was very little refinement Shaikh Abdul Hayy Lucknowi, the researching scholar of the Hanafis also repels and rebuts this understanding of the refining of the madhabs and in fact elucidates that the followers including the scholars of the madhabs were mutassub and bigoted. We have already mentioned this before, but again it is pertinenet to be mentioned here. There are also other differences in which they have shown extreme bigotry and scare monging tactics and thereby strongly refuting and rebuking the opinions of the other madhabs. What impression and understanding does this give the hanafi muqallid with regards to the other madhabs and people who believe one must recite fatihah behind the Imam, how comfortable would they feel if they happen to pray in their masjid!!! Who from the ahnaf takes this REFINING, that although he was informed about all the punishments and sin of going against the position of the madhab, it was more beloved to him to follow the evidence from the book and Sunnah. This is also the refining and correction, so why do we chose which refinement we take and which one we abandon? Another problem with this concept and theory is that some eminent hanafi scholars said, those who claim there is no mujtahid after Allamah Nasafi and by this they mean mujtahid fil madhab and with regards to ijtihad mutlaq they say it finished with the 4 Imams to the extent that they said obligated and necessitate taqlid of one of the 4 imams. There is also the possibility that a scholar can be wrong in their ijtihad and we have shown this from examples of inter madhab differences, reconcilaitions and corrections. However a scholar can be wrong in his rulings and his ijtihad and as we from the hadeeth he will only get one reward and two if correct. (Bukahri, Muslim and Abu Dawud). Therefore this shows mistakes and incorrect rulings can be made and for this they can not be shunned as they are scholars. Yet again the question and pivotal point is, what is the obligation and command upon the Muslims and indeed this has been clarified and to repeat for the sake of reminder and that is that we return to the Quran and Hadeeth. Lets take an example where refining and correction has not taken place and it also shows by theis notion is a myth and a poor understanding of the reality. It seems like Shaikh Mulla Ali Qari rebuked this horrendous hanafi position (Mirqat Sharh Mishkat 6/298) and yet despite this there are halalah centres in some muslim countries. Another example is when such corrections within a madhab are abandoned, is that the official position of Imam Abu Hanifah, Shaikh Muhammad Hasan Shaybani and Shaikh Abu Yusuf with regards to eating a lizard is that it is unlawful. However Shaikh Tahawi said there was no harm in eating it. (Mukhtasar at-Tahawi pg.441). Likewise he considered the urine of a camel and Horse mean to be halal. (Mukhtasar at-Tahawi pg.434). 5) How can a layperson tell which hadith is weak and which is strong without blindfollowing? This is indeed a very strange way of trying to prove the reality of taqlid and its legitimacy. It is actually a very poor standard of comprehension to stoop to such a level of scholastic presentation of such a concept. What is further bizarre is their limited and poor understanding of the deen as well as the illustrious disciplines of the Islamic sciences. Just because a hadith is graded to be sahih or weak does not mean by acting or following the hadith you are doing taqlid of the one who graded it. Likewise a hadith being cited in Bukhari is not considered to be Sahih just because it is transmitted in Bukhari. Furthermore the grading of the hadith based on the conditions of the science of hadith has stringent conditions and proofs for this. The reality and main reason that this point even got mentioned was due to the poor or ill understanding of the definition of taqlid. 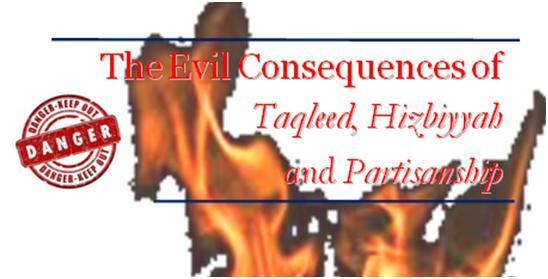 It is very important to understand the various definitions of taqlid. When the scholars of hadith grade ahadith, they look at a whole host of evidences, they look the trustworthiness, the precision, accuracy, character etc and after all of this they grade a hadith. So they do base them on evidence ie they say such and such narrator is trustworthy as due to the principle of hadith, no criticism has been levelled against him. Also on the other hand the scholar may say such and such narrator is weak due to the fact that he was a liar because such and such imam said, this is proof right and they will back this up with evidence. How on earth is this taqlid??? So all of these gradings are taken based on evidence and not a scholar saying oh I say that hadith is sahih or weak just because I say so. We have never said or advocated that the lay person is to know these sciences or that he must have a certain level of understanding to discern a difference beween sahih or weak. The scholars are agreed in that mentioning praise and criticism and taking this is not from taqlid as this falls under the category of information. The same principle applies to a witness in front of the judge ie the Qadhi or likewise a person referring to a Qadhi for a fatwa has never been termed or understood to be taqlid. Similarly when a Qadhi seeks the testimony of a witness, no one refers to this as taqlid and none of the scholars have ever labelled this as taqlid because here the principle is the same. So how can this be called taqlid. At the same instance is this not ijtihad of the scholar and following his books or gradings is synonymous in asking him directly and whatever the outcome it is understood to be his ijtihad. So for this ijtihad he could either be right or wrong and this necessitates 2 reward for the former and one for the latter. These are just some of the thought that we had, unfortunately due to the lack of time we were unable to expand more on some of these points. We pray to Allah, The Almighty and Majestic that he keeps us firm on the Quran and Sunnah and keeps us away and saves us from the blind, bigoted staunch partisanship of taqlid. Ameen. Allah willing we shall be presenting more articles and booklets on this subject. As for those who say we refute taqlid yet (blindly) follow the scholars when it comes to the issues of the rulers. Then we say their comprehension is poor, weak and based on emotion rather than looking into the issues deeply. Picking upon a few words of the Scholars is indeed injustice and way of Ahlul Bidah. We don’t follow your way because its precisely this reason that we don’t make taqlid, how about that for comprehension to begnin with. In addition to the loud mouth (or trigger fingers in this case) who poste one liners in their defense of taqlid on firums, are known to make alot of noise and thats all that it is, with nothing substantial and as we have previously said compiling a list of scholars who forbade taqlid shaksi is what the salafis and Ahlul Hadith have reduced these modern day champions of taqlid. What a joke. We pray to Allah, The Almighty and Majestic that he keeps us firm on the Quran and Sunnah and keeps us away and saves us from the blind, bigoted staunch partisanship of taqlid. Ameen.